There's no doubt that good as it is, it's Heath Ledger's performance as the Joker that really makes Batman: The Dark Knight. Since his death in January, due to an overdoes of sleeping pills and anti-depressants, one has to wonder whether or not this was a case of a role overtaking an actor. In order to portray the anarchistic nihilist, Heath had to summon up emotions that would be powerful and dark, a place he'd never gone before as a performer. Of course, his fellow actors deny that the role played into any contribution to his death. But add the depravity of the role's emotions to his recent breakup with Michelle Williams and his separation from his daughter, and maybe the darkness became too real. David Cohen and Ethan Sacks report friends saying that talk of the role made Ledger go somber. All artists have to experience the brink of the abyss in order to capture really great art. There's no doubt that as an actor, Ledger achieves that here, and quite brilliantly. Whether or not he was able to pull back from that abyss in real life, we'll never be able to say. And if, indeed, the overdoes was nothing but a haphazard accident: well, it was the sort of pointless, tragic accident of which The Joker would be proud. SPOILER ALERT: for the rest of this discussion, I'm just going to plow right into what happens in the film. If you haven't been able to get a ticket yet, STOP READING NOW. Get online and get your reservations. Come back after you've seen the movie. Since you won't be disappointed, feel comfortable going with the crowds on this one: the crowd reaction, particularly a crowd of people who don't know what's coming, is one of the more enjoyable parts of seeing the film. First, let's acknowledge that this Batman, written by director Nolan and his brother, is SO much better than the first (and achieves what no other movie this summer, with the exception of WALL-E, achieves: unity of theme and story. Even Iron Man, smart story telling as it was, was a bit confused about its message). Perhaps this is an argument for the writer/director - they know not only how to create character and metaphor, they know how to display it. Let's follow some of the wonderful themes. Like playing cards. Ledger refers to the DA, Harvey Dent, as Batman's "Ace in the hole." But really, Harvey, and his girlfriend Rachel, are Gotham's King and Queen. Batman is the Ace (after all, the good guys would be able to do nothing about bringing Lau back from China without Batman - Batman trumps all the other rules), and commissioner Gordan the Jack, the loyal servant. Now...throw the Joker into the mix. As Heath tells Batman while he's being beaten up in his bad cop interrogation, "I don't want to kill you...you complete me." Because, of course, Batman's Ace is the mirror of the Joker. The anarchist and the vigilante both thrive on chaos: one to cause it senselessly, the other to use it to society's advantage. The joker would get no laughs if there was no Batman to taunt, no willful purpose to try to upend. What's fascinating is that this movie is interested in the nature of that card: the Joker. What is the Joker, what does it mean, and what does it mean to us, in a post 9/11 world? Lucious Fox's cell-phone snooping sonar machine is able to spy on all the calls in Gotham, coincidentally parallelling the recent FISA debacle. Batman's ethics requires the machine to be destroyed as soon as the criminal is caught. We're meant to see even using the machine this once as crossing a line - a line that needs to be crossed to catch a bad guy. But with even Obama supporting FISA, is this really that much of a line, any more? Interesting, we live in a world that's even more cynical than the Dark Knight. But the movie would have us watch Batman cross a line only to emphasize that there are no lines for the Joker to cross. He is the WILDCARD in all senses: funny, ludicrous, deadly, whimsical...the pure antagonist, he only believes in upending whatever plans are in place and unmasking everyone's pretensions. While all the other "cards" in the movie have their faces - some even have Two Faces, their public faces and private faces, their white faces and black faces. The Joker has no face. No identity. No fingerprints. In the first classic "establishment" killing (by which I mean, the Joker - who starts off as a nobody - has to earn his criminal stripes by bumping off the criminal who doubts his ability. It's a classic of cinema which we last saw wonderfully parodied in the Kill Bill movies. ), the Joker takes a pause from the killing to explain how he got the way he is: his father did this to him, see? But here's where the fun comes - the next big scene with the Joker, we get this "classic" origin story a second time, only this time, it's his wife. You see? Nolan plays with the convention and we get a different story every time we meet the character. There is no real psychological explanation for the Joker that we'll ever know: he's a pure cipher. One who believes in mischief more than anything. When all those people on the ferry are debating about pushing the button and blowing up the other ferry, none of them ever stopped to think whether the Joker might be...playing a trick? Did you or did you not believe that those buttons controlled the the detonators on their own boats, not the other? Nolan never tells us: and that's how we know this movie works. He doesn't need to tell us - he's told us all we need to know about the Joker, and who he is. The rest of the fun is up to us. None of this would work without Ledger's amazing performance. He digs down into this cipher and comes up with all the gestures that make us see both the joy and the fear in pure chaos: a nervous laugh, a bit of self deprecation, a quirky walk, a supreme confidence, a kind of smarmy simpering, and a voice channelling the venom of the most dangerous drunk, the darkest schizophrenic. He has a theory, that people are basically animals with masks, and a job, which is to remove the masks and unleash the animals. He starts off wanting to unmask Batman, only to realize he doesn't need to: the guy is already an animal. So he changes his sights (hey, chaos is nothing if not resourceful), and has his success with Harvey Dent. And his fun with the bat. Perhaps this all best comes together when the Joker blows up the hospital. The Dark Knight is not a CGI movie - perhaps this is what makes it so successful - it's a bow to classic stunts cinema. So come up with a great classic stunt, like a blow up of a building. Now add to that stunt a completely unhinged, unmasked, lunatic performance. You get one amazing moment of the film, the Joker walking out of the building in a nurse's outfit while the building blows up: his face a series of glee, annoyance, disturbance, ennui, even fear at his own creation. As Ledger acts his way in front of a building blowing up, you realize you are being held captive by an actor's performance. We've had these moments - these visceral "ah hah!" moments of amazing cinema in movies recently: when the car is swept off the ground in James Bond as the plane takes off; as WALL-E discovers Eve's wonderfully perfect shape and purpose. But it's rare to have that moment as a mixture of imaginative old-fashioned explosives as amazing acting. It may be tacky to point this out, but there a few moments in the film - and only just a few - where Ledger's untimely death has created some problems for the post-production continuity, and the big moments that could deliver the themes more fluidly. What was the trick that allowed the Joker to escape the cell with the knife (since this escape is the key to the Joker's whole setup, wouldn't that be a trick worth seeing)? What were the big words to Harvey Dent that supposedly was the Joker's coup de grace in unleashing Two-Face's hidden animal (Harvey has a chat about his anger, but wouldn't you think Ledger could have given him a nice soliloquy to put the final stamp on things, something the Joker doesn't shy away from in other moments)? 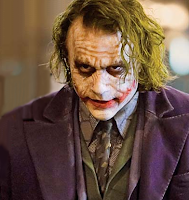 And wouldn't it have been better, knowing that Ledger would be unavailable for the next film, to give the Joker a more fitting and definitive send-off (and the film a more satisfying ending)? Had Ledger been able to come back from the grave, no doubt Nolan would have had in him for some post-production tweaking to solve these problems. But these are things, unfortunately, resulting from a tragedy that cannot be held against the filmmakers. And they hardly detract from Ledger's star turn. No one can doubt, after this final performance, a posthumous Oscar is in the cards for Ledger. And one can only appreciate even more how much his talent will be missed.